In a country the size of Portugal there are three distinct and diverse worlds: Exuberant tropical nature & rainforests. Caribbean spice & charm with some of the world’s best diving. The ancient civilisation of the Mayas back brought to life. There’s also the warmth & friendliness of the people plus the fact that Honduras is the original ‘banana republic’, but that was a long time ago in the 19th Century. The flight north in the tiny Isleña Airlines plane took just 25 min from San Pedro Sula to La Ceiba on the coast. Buffeted by wind & rain, we flew over flat very green landscape, dotted with small towns & villages and criss-crossed by mud-brown rivers. After a short landing in Ceiba, we took off out to sea for 18 min to Roatán, the largest of the three Bay Islands. 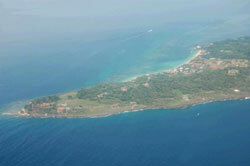 This thin narrow strip of island (65km long) is being developed with new infrastructure and a lot of building. The population has almost doubled to 30.000 with the arrival of Spanish-speakers from the mainland. English & Spanish are spoken side-by-side. There are lots of funny English place names like West End, Oak Ridge, Coxen Hole, French Harbour etc. which you just don’t expect to find in the Spanish Caribbean, until you learn about the island’s mixed history. 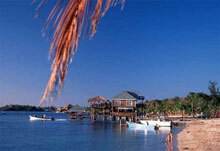 Business in Roatán means real estate & tourism, and business appears to be booming. There’s also a brand new terminal for the ferry from the mainland at La Ceiba which now takes only 1 hour to reach the island. Anthony’s Key is a diving centre with a large marina full of well-equipped boats for divers to discover the world’s second largest barrier reef. Beginners & experts alike come from all over to Roatán for snorkelling and scuba diving which is still excellent value here and the cheapest in the Caribbean. 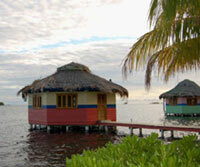 The resort offers 56 rooms in small ‘cabañas’ looking out over the deep blue sea & sky. Active & Idyllic! For something completely different - meet a dolphin in a Dolphin Beach Encounter or go swimming, snorkelling and diving with them. Even the basic beginner’s experience is a sensational one as you stand there waist-high in water, next to handler who is communicating with the dolphin through a high-pitched whistle and a good supply of fish. When she (the dolphin) gets used to your presence, you can start talk to and touch her, and eventually this culminates in a big kiss. It may sound kitsch, but there is nothing quite like being kissed by a young female dolphin weighing 120k, a flick of whose tail fin could do very serious damage indeed. And as the experience progresses you realise that here is an animal which is far more intelligent and athletic than the average human being. Mango Creek is an eco-dream-come-true for the North American couple, who have developed this fishing lodge, and their excellent local Roatán guides. 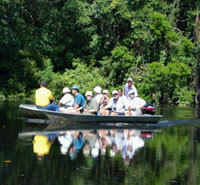 The property, which specialises in bone, fly & tarpon fishing in the surrounding shallow waters, is only reachable by boat. Yes, you can also just rest & relax on the beach or by a pool at the Mayan Princess or Henry Morgan, all-inclusive resorts next door to each other at the West End of the island, and do absolutely nothing……. For some serious eating I strongly recommend Dian’s Garden of Eat’n in West End, where everything sounded so fresh & delicious that I could have ordered every dish on the menu – even the Blackened Mahi Mahi Filet or the Wahoo Filet with massaman curry sauce. It’s Caribbean cooking at its best with Asian flair. In the end I went for larger-than-life Dian’s Island-style crab cakes (4.6€) & Lobster Tails with Thai chillis, dried apricots & walnuts (11.6€) – and delicious they were too! If you are looking for some more ‘active’ relaxation, then there’s the Santé Wellness Center Spa at Parrott’s Key. 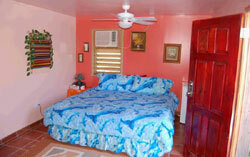 Spa owner, Angela Missaggia and her local team offer 3 charming double rooms. Specialities include massages and facials with many different oils, including the Noni fruit (originally from Polynesia) - an excellent source of anti-oxidants and claimed as a cure for all types of ills. Its only disadvantage is that it smells a lot like Stilton or Roquefort! Back by mini-plane to La Ceiba – an agricultural & commercial town producing bananas, pineapples and other fruits for export. La Ceiba is also the partying capital of Honduras with its lively ‘Zona Viva’ winding along the waterfront and full of restaurants, bars & shops. It’s also a centre for eco-tourism, thanks to its proximity to beautiful national parks & nature reserves. The Lodge at Pico Bonito describes itself as ‘a remote, luxurious & exciting eco-lodge in the buffer zone of the largest national park and rainforest in Honduras’, and it certainly lives up to this claim. Built by a Honduran architect with fallen trees from Hurricane Mitch, Pico Bonito offers relaxed & comfortable luxury and good food from local produce, wherever possible. A great experience as long as you never forget your anti-mosquito protection! The bird, butterfly & insect life is stunning as you would expect. To get there you take ‘la Unión’, the oldest railway in Honduras, built by the Standard Fruit Company. The reserve is named after the two rivers which enclose it to the west & east. Going out by boat is a wonderful experience and if you keep your eyes & ears open – you can see all types of exotic birds, white-faced howler monkeys (there are some 800 in the reserve) even a manatee if you’re really lucky – all as you glide quietly through the dark creepy mangroves. The Wildlife Sanctuary, which offers basic accommodation & food, works in close co-operation with the local communities which benefit directly from tourism. Here $5 feeds a family for a week. 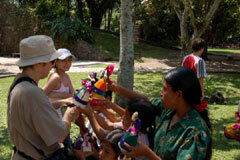 Copán is world-famous for its Mayan Heritage and is Honduras’ top tourism attraction. It is one of two UNESCO World Heritage Sites in the country. We had the honour and the luck to be taken around personally by David Sedat, Field Director of the University of Pennsylvania’s archaeological project in Honduras. David looks & talks like the archetypal archaeologist, but that would be to underestimate him - his erudition and passion. As he told us at the start, “Archaeologists never die, they just talk & talk” and talk David certainly did for 3 hours non-stop. But you could have listened to him for 30! 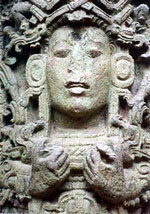 The story of the Mayas is fascinating and how they probably started settling the Copán Valley in 1500 BC (Before Christ). By 800 AD they had constructed the Athens of the Mayan world with 20 to 30.000 inhabitants and then suddenly, inexplicably this amazing civilisation disappeared off the face of the planet. Today, despite many exciting discoveries and theories, there is still so much mystery surrounding this talented people. David Sedat’s recommended reading before arriving Copán is the book, ‘Scribes, Warriors & Kings’which is the most authoritative guide yet. Don’t miss the Hieroglyphic Stairway with its 2500 symbols covering 14 different Mayan reigns. Discovered in the 1890’s, it too is still very much a mystery. David Sedat has another string to his bow – the defence and propagation of the Noni fruit both for its healing & medicinal powers, but also because it protects the hillsides around the valley from dangerous erosion. In fact he believes that this same erosion which is happening in Copán today could have caused the fall of the mighty Mayan Empire as their whole agricultural model became unsustainable. This bird & nature reserve is an eco-tourism project, run by owner Lloyd Davidson, in 4 hectares of forest, next to Copán with brightly coloured macaws, parrots & toucans. There are over 100 of these exotic tropical birds and they have all been donated. There is also a small organic coffee plantation. Hacienda San Lucas has been lovingly restored. It combines first-class service and authentic Maya country cuisine with a spectacular view over the Copán Valley & Ruins. 8 rooms with solar lighting, comfortable hammocks, sunsets to die for, candlelit dinners……. Whichever countries you visit you have to fill in identical immigration & customs forms for each one. 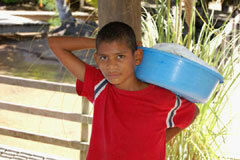 One day there will just be one form and all Central America will share the information. In the meantime you need to be patient, take a good book with you in the immigration queue or chat to the locals, who go a bit faster but not much. Surprisingly, with the increase in the number of Europeans visiting Central America, Honduras is not good at exchanging Euros in its banks. However, at the airport you will find a group of men hanging around inside the bank itself, who will come outside with you, produce a large wad of Lempiras and change your Euros (at 20 instead of the official rate of 24). Look for small exchange bureaux in the big cities. Otherwise you have to change everything into $ before you arrive, and then you lose out twice on the exchange. In case of any serious problems, go straight to the special Tourist Police who have an office in each major town. Facilities are a bit primitive. In Tela they had a 1960’s portable typewriter with carbon paper, the like of which I had not seen for 25 years, but they were friendly and able to provide an official statement for the insurance. Remember to keep some money back for the inevitable Departure Tax (around $30) at the end of your trip. It is rarely included in the price of the ticket and normally has to be paid in cash. For Central America you need a tri-band mobile phone, and then you’re free to send text messages and call Europe at much more reasonable prices than those charged by the national telephone company. I learnt the hard way and paid the hotel 46€ for my 7 minute conversation with Brussels! Take small light-weight binoculars with you wherever you go. You never know when some miracle of nature – a bird, animal, butterfly etc. – is going to pop out in front of you. Following the demise of Air Madrid, Iberia has announced an increase in the frequency of its flights to Central America from 7 to 10 a week which includes a direct daily flight with no stopovers to San José, Costa Rica. Iberia uses the latest A340-600s with 52 seats in Business Plus and 300 in Economy. The 9.000km flight from Madrid to San José takes 10h30 and there’s a 7 hour time difference, meaning that you arrive just after you have left in local Costa Rican time. Try to avoid going via the USA, if you possibly can. You hear so many horror stories of the way people are treated by US Customs & Immigration, especially in Miami. And that applies as much to Europeans as to Latin Americans. 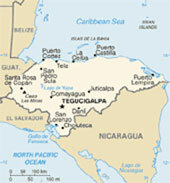 Once you have reached your Central American gateway, TACA will then fly you all over the region. Plan your trip with a degree of philosophy and patience. You will need to be at the main airports at least 2 hours before your flight and then, especially in the rainy season, there are meteorological conditions which can cause unexpected delays. If it’s any consolation, remember it’s precisely this rain which is responsible for Central America’s astounding nature. Contact the local Honduran Embassy where there is always someone who has tourism as part of their portfolio. The Honduran Tourism Board (IHT) has an excellent and very comprehensive website with a warm welcome to Honduras on its home page from larger-than-life Tourism Minister, Ricardo Martínez – it’s not often you see this sort of thing, where a Minister personally explains his strategy for the intelligent development of tourism. If you are planning to take in various countries, there’s the Central America Tourism Promotion Agency (CATA), based in Madrid, which has a website in both Spanish & English. It is partly a portal to the 7 individual destinations, but also has useful sections on themed ‘experiences’ across the region – Diving, the Mayan World, Colonial Cities, World Heritage Sites, Adventure, Ecotourism……. 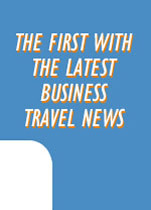 The main reason for CATA existence is to promote cross-border Central American travel to the Europeans. There’s a good 320-page guide in both English & Spanish, HONDURAS tips, published at least once a year with lots of helpful tips and recommendations. Get a copy once you’re there, but have a look at their website before you go. 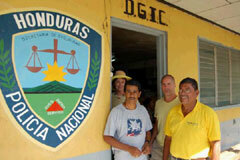 Honduras is a fascinating country with enormous potential for intelligent tourism. But two modern-day curses are cruises and condominiums which never bring as much long-term benefit as everyone tries to makes out. If their development is not strictly controlled, they can spoil the very thing that future generations of visitors will want to see most in a country. Honduras needs to protect itself, and especially the Bay Islands, from this new form of short-term colonialism and implement a clear strategy for sustainable tourism over the next 20 years. Otherwise it could destroy both the chicken and the golden egg.